To better understand this concept, we must first acknowledge the distinct difference between the material plane and the spiritual realm. While we exist in the spiritual realm our souls are determining what our next life will entail – where we will end up, what end goal we will accomplish and other important ‘big picture’ plans. This is where our soul resides between lives on the material plane. On the material plane we are not as aware and in tune to the big picture that we are such an important part of. Our spirits are aware of how we fit into the complex, universal puzzle, however, this knowledge isn’t readily available to us during our material lives. We focus instead on the world around us and where we are at today. This is where cosmic connections become important. These people are brought into our life specifically to guide us and lead us along the path as set out by that universal puzzle. They may be positive people that inspire and motivate us or even those that are difficult to deal with, teaching us valuable lessons from our interactions. These connections were specifically chosen by our spirits while in the spiritual realm, each with its own distinct purpose in our lives. 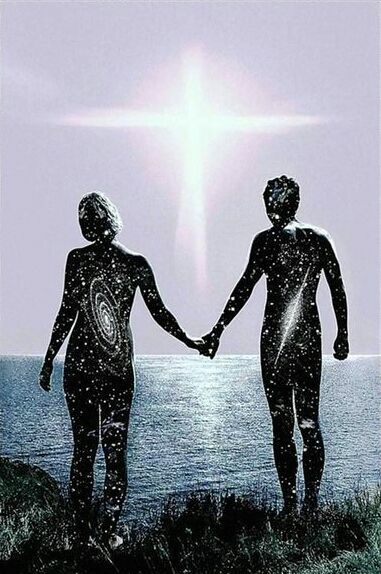 How, then, do you know if someone is a chance meeting, or a cosmic connection entering your life? Often a connection is brought to us that is currently living some aspect of life in a way that we should be aspiring to or working towards. Seeing that they can live this dream life is often the reminder thatwe too can obtain that lifestyle if we only focus and work towards it. They help us remember that anything is possible. The material plane has become a fast-paced whirlwind of information, often grabbing us and sweeping us up in the flow. If we aren’t careful we can be swept far off our spiritual course with the blink of an eye! These connections will help us to stop, slow down, and make conscious decisions in our lives. Not all lessons from our cosmic connections will come to us in the form of happy experiences and positive inspiration. There are some connections that enter our lives to force us out of our comfort zones and challenge us to truly examine ourselves, and that’s not always an easy process! When a cosmic connection enters our life, they aren’t focused on the mundane routines we have created during this period on the material plane, but rather the overall journey. They shake up our life as we know it, forcing us to re-examine and reconsider the way that we are currently living. When you find yourself overwhelmed by the material world, it can be easy to fall into the trap of closing ourselves off to protect our hearts. In order for us to continue on our spiritual journey and find our ultimate place in the universe, we must have our hearts open to the higher purpose behind every experience. 6. They Remind us of Our PurposeEach of us was placed on this earth with a spiritual purpose, however, that purpose can easily be forgotten in the hustle and bustle of life. When we listen to the influences of those around us we can get off course, and it takes a close, instant cosmic connection suddenly in our lives to remind us of who we really are at the spiritual level. There is no greater obstacle for our spiritual journey than the pain from our past. Some cosmic connections are brought into our lives with the purpose of healing our souls, allowing us to face and overcome these past experiences, and in doing so move forward confidently.